I soon realised that the wait had not been worth it. Carl St Clair’s conducting is undistinguished, as is the Staatskapelle Weimar’s orchestral contribution. Bar-lines are all too frequently audible, nowhere more so than in the descent to Nibelheim. The orchestra sounds light and, worse, thin throughout: not emphasising allegedly Mendelssohnian antecedents, but simply underpowered and uninspired by the direction. At the end, the on-stage harpist seems to be the only harpist at all; moreover, either she is amplified or there is sonic trickery at work. The orchestra improves in Die Walküre, though this is certainly not a memorable musical account. There are difficulties here too: never have I heard the conclusion to the first act sound so underwhelming. One really needs Furtwängler, though, on film, Boulez/Chéreau will do perfectly well; the Weimar orchestra by contrast sounds grey and exhausted. The Magic Fire Music suffers similarly: how does one render it so colourless? Singing is often little better. Christine Hansmann’s shrill, squally Fricka is outshone by Marietta Zumbült’s Red Riding Hood Freia. Mario Hoff’s Rheingold Wotan is inappropriately light, succeeded in Die Walküre by Renatus Mészár, darker-toned, though hardly ingratiating or idiomatic. He makes a much better Fasolt. Whether through design or default, the casting of Alberich and Fafner/Hunding brings considerably lighter voices than the norm from, respectively, Tomas Möwes and Hidekazu Tsumaya. Möwes’s Alberich often veers dangerously close to Sprechgesang, although, given his approximate pitch elsewhere, that may have been wise. Musical relief hails from Erin Caves and Kirsten Blanck as the Volsungs, the former providing irreproachable diction and the best vocal performance; he also impresses as Loge. Catherine Foster’s Brünnhilde proves variable: an intelligent portrayal. However, a pronounced beat and increasing intonational waywardness reveal themselves during the third act. Let us return to Michael Schulz’s production, in which a certain disregard for musical values has already announced itself. Domesticity is the watchword. ‘Mark well my new poem – it contains the beginning of the world and its destruction!’ Thus wrote Wagner to Liszt in 1853. In Weimar, where Liszt was then based, 2008 brings nothing so consequential. There is a falling out between Wotan and Alberich, perhaps old friends, and a soap-opera feud thereafter. We are constantly reminded of the ‘other’ members of the families, especially Clan Wotan, though to what end remains obscure. Just when, during the second scene of Das Rheingold, set in a not very affluent house, it seems as though we might be in for a hint of Ibsen, the strange, brightly-coloured mugs on the table, not to mention the characters’ behaviour, push us back in the direction of EastEnders. No wonder the gods wish hastily to move into Valhalla. The dignity of Wotan’s music, just about conveyed by the orchestra, is belied by his inexplicable inability to unhand his consort. I wonder whether, whilst once it might have been necessary to divest these gods of their divinity, now might be the time to restore at least some element of their erstwhile aura. How, otherwise, are we to understand Wagner’s Feuerbachian alienation of human qualities? Alberich, however, is a dwarf – at least for some of the time – by virtue of the aforementioned shoes being strapped to his knees. Standing tall when Lord of Nibelheim, he reverts to size when captured. We actually see him as a toad, which may cheer stage-direction-fetishists; yet, given the lack of a serpent or Alberich’s invisibility, this here seems at best naïve. Mime is a cleaner, not a skilled smith. Wagner’s distinction between Handwerk and Kunst therefore goes for nothing in a simplistic reduction of craft to the menial; we shall see what happens in Siegfried, when the ‘artist’ appears. Why Mime at one point emerges with a baby in his arms I have no idea. It is a nice touch, though, to witness his delight at Alberich’s capture. Both are in thrall to the proto-Nietzschean will to power; Alberich has simply been more successful to date, thereby feeding his brother’s ressentiment. An undeniably powerful moment is that of Wotan’s possession of the ring, when he severs Alberich’s finger. Loge looks genuinely shocked. ‘Doch, durch Gewalt!’ one might exclaim, against Wotan’s earlier warning to Donner. Sadly, the orchestra merely sounds petulant upon Alberich’s departure; the curse barely registers. Fasolt’s reluctance to abandon Freia shines through, in touch and glance, and is interestingly complemented by reluctance on her part. The image of weighing scales makes its point clearly in the dialectic between love and power: Freia and hoard. It is in this final scene of the Vorabend that a guiding visual motif imprints itself. Echoing – consciously? – Ruth Berghaus, covering of eyes becomes the customary salute to Wotan’s bartered eye. 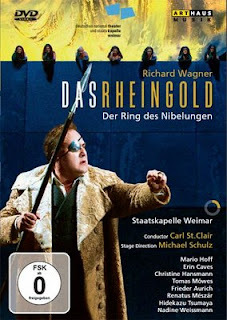 Subsequently, in Die Walküre, there is a degree of horror to the occasional removal of his eye-patch. Unfortunately, as with so much else in the production, the broader point is unclear, likewise how it might fit with the rest of the domesticated re-telling. Is it a reference to Wotan’s craving for knowledge and its cost, or a banal reminder that someone who has lost his eye might unleash his anger upon others? Die Walküre has another delayed opening, Freia as on-stage harpist accompanying excerpts from Wagner’s sketches for Siegfrieds Tod, sung by the Valkyries at home in Valhalla. Wotan is the proud father. On marches Alberich, with the boy Hagen, who screams and obliterates the song: no great loss. Only then can the storm begin, Wotan presenting Siegmund and Sieglinde as children with blindfolds, Sieglinde later wearing hers around her wrist. They are worn again in the final scene, to be cast off upon the triumphant naming of Siegmund. Hunding’s status in a brutal society is underlined by the presence at dinner of his clan, replete with baseball bats. Wotan – who seems to be invisible – performs undercover work amongst them, the Wanderer before his time. His hat cocked as it is, he disconcertingly resembles Daniel Barenboim in a widely-disseminated publicity photograph; I assume the likeness to be incidental. Instead of extracting Notung from the tree, Siegmund simply receives it from Wotan/Wälse. Incorporation of extra characters becomes almost farcical in the second act. Fricka arrives with her rams, all of whom wear spectacles, a sneak preview already granted at the end of the first act, when, to add to St Clair’s musical anti-climax, the Volsungs disappear and Hunding prays to Fricka. A truly mystifying reappearance seemed to be that of Erda, present for much of the second and third acts. During Wotan’s monologue she brings on a cadaver for tentative inspection, eventually leaving with Brünnhilde – and a suitcase: who said that Regietheater clichés were dead? She returns later on, to lead off Brünnhilde once again, this time with Sieglinde in tow. In the third act, and this was where I thought I gleaned some sense, she presents her daughter, in Wotan’s presence, with a wedding dress. Given the portrayal of the Ride of the Valkyries as a girls’ dormitory pillow fight, I assumed that Brünnhilde was fated to leave the Valhalla nursery for a life of bourgeois domesticity in her own household. Perhaps that was so, yet my incipient reading was thrown into confusion by the discovery, upon reading the cast list, that this elderly woman had not in fact been Erda, but Grane: a trusty and versatile steed. It should perhaps not surprise that Weimar’s German National Theatre, long without a Ring, should elevate stagecraft over music, though I fail to see why the choice should be posed. Nevertheless, it is difficult to imagine who, other than those who attended in the theatre or the most indefatigable of completists, would consider der ring in weimar, at least so far, to be other than inessential. What truly saddens is how dull the Ring has been rendered. Watched on television need not resemble made for television. This review first appeared in The Wagner Journal, 3/3, pp. 96-99. Click here for further information on the journal, including subscription details.